SILKS spatial moduleji GIS tools aika kar aser aji navigation & simple data querying, aji zoom in, zoom out, zoom to full extent, selective zoom, re-centre tool, pan, distance measuring & print map tools mela-mela inyaktsü atema.Features on the map mela meteter aji Map Identify tool amshiba ajanga. Distance measuring tool of map a tensema lir aji part of spatial map analysis tool ama. Results of map query/area of interest ji Detail legend den rateper, aji print tool amshia. 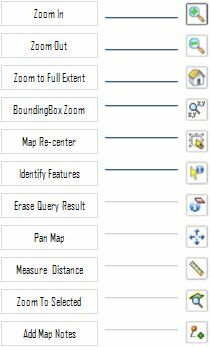 Iba tool amshia, size, font type & map output ji customized asür. Mapji file format aika nung adoktsü akok aji PNG, JPEG nung, & GIF/PDF nung. QuickZoom tool amshia region specific zoom yanglur. Map navigation tools & control aji zoom in, zoom out,, zoom to full extent,, selective zoom, re-centre tool, pan, distance measuring & print map tools, aika kar. Map nung features ji Map Identify tool amshia identify asür. Distance measuring tool of map ji spatial part maps analysis tool nung tensema lir. Map query results/area of interest ji detail legend ji print tool anshia, print out asür. Iba tool amshia size, font type, map, output customized asür Map ji file format nung aji PNG, JPEG, GIF/PDF nung produce asür.Region specific zoom ji QuickZoom tool amshia yanglur. Searching of non-spatial attributes ji tamshir I perform asür. Tamshir I tamasa layer ka shimteter aser iba sullen listed fields/columns nungi shimteter. Attribute koba bushitsü ali aji textbox nung air. ‘Search by Value’ nung click asubajaki pop up window yanglur.